Difference in quality of photos? amazing in just a few clicks. PinkMirror is Do-It-Yourself tool. 4 Simple steps to retouch your portrait and look at your best. World's Best Automatic Portrait Retouching. Embarrassed by dark marks, freckles, age spots or scars? Don’t stress. PinkMirror automatically transforms your skin in photos, and makes it look soft, smooth and glowing. Best of all, you won’t even have to perform any work to get beautiful-looking skin, since PinkMirror instantly covers up skin spots for you. Imagine your face without wrinkles, crow’s feet and frown lines. Now, consider that PinkMirror naturally makes your signs of age disappear, while maintaining your authentic beauty. Your results are always instant. Did you know that having a slim face is consistently rated as the #1 most attractive feature that people look for in others? It’s true. PinkMirror’s face slimming technology is designed to automatically cut away the perfect proportion of fat from your face. This leaves you with a face that appears slimmer, healthier and much more attractive in photographs. Teeth whitening can have a major impact on your close-up photographs or portraits. Most importantly, you need professional-quality digital teeth whitening that appears natural. PinkMirror’s natural teeth whitening feature automatically makes your teeth appear bright, white and healthy. Having wide eyes in photos can make you appear more youthful and feminine. Our eye widening feature is perfect for enhancing profile pictures on social media and dating websites - where you need to look super cute. People typically have red eyes in photos when shots are taken in low light environments. This is especially true when the camera flash is used. PinkMirror automatically detects and removes red eyes from photos whenever this is an issue. With brighter eyes, you’ll appear more upbeat and energetic in photos. This feature is perfect for corporate portraits or professional images where you need to appear alert. Add natural color and depth to your skin tone, while also smoothing over blemishes, rosy cheeks and other subtleties in your skin that need to be repaired. Fix the wrong color your camera might have introduced into your photo. Our PinkMirror photo editor understands what you want, an amazing picture that shows who you are without blemishes, acne, stained teeth, wrinkles, or other unsightly features- because your appearance is important! PinkMirror program can enhance your portrait with few clicks. I found PinkMirror through a graphic design forum. At first, my expectations were low, because most photo enhancement tools are too complicated to use. But after using PinkMirror, I was SO HAPPY with how I looked in my picture. And it was so easy to use! Thank you PinkMirror! Finally found a website that can instantly edit my photos for a reasonable price, and do a good job. Needed my photo edited to look more professional for a company portrait. I was expecting maybe a small enhancement, but PinkMirror seriously impressed me with quick and natural results. Got the auto photo touch up I wanted. So much easier than doing it yourself in Photoshop. I desperately needed to touch up one of my photos. Let’s just say that after trying a bunch of photo editing services - PinkMirror delivered the easiest and highest-quality results. At PinkMirror, we are trained in understanding human beauty and finding ways to help you improve yours. Think photo enhancement tools are difficult to use? 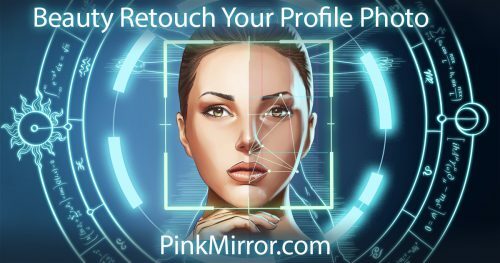 PinkMirror is the world’s fastest and easiest beauty enhancement suite that transforms your photos in a matter of seconds.